March arrived and about half the pods I am aware of have been enabled and are now accepting orders. Infuriating as it is, mine is still not enabled. I am hoping that it will be within the next few weeks since most of the pods were attached within the same couple of months (though, I know quite right it means nothing). Interestingly enough, addresses that are enabled are all showing Amber to my knowledge regardless of estimates. Oh God, I hate to hit my own thread up with what is essentially a non update in some regards. Still no enablement yet. Had some contact with OR, reckons only a few weeks since engineering works have now been completed. I have a feeling it will be the last to be enabled since the one down the road - despite being fitted a few months after - is already enabled. Looks like I will either jump on the Zen or IDNET ship - probably the former since cheaper activation, monthly cost (for 330/50, £7.81pm cheaper) and a "free" router. How is Zen's IPv6 anyway, if someone could advise? There's me thinking £43 a month for unlimited 380/21 was a bit steep, £70 for less even if with AA is down right expensive in my mind. I understand how A&A is positioned in the market and its appeal to certain users. I think I am no longer it's target audience, at least when G.fast arrives. I don't think 2TB is a terrible allowance, even at Ultrafast speeds I'd probably struggle to chew through more than a single TB under normal circumstances. 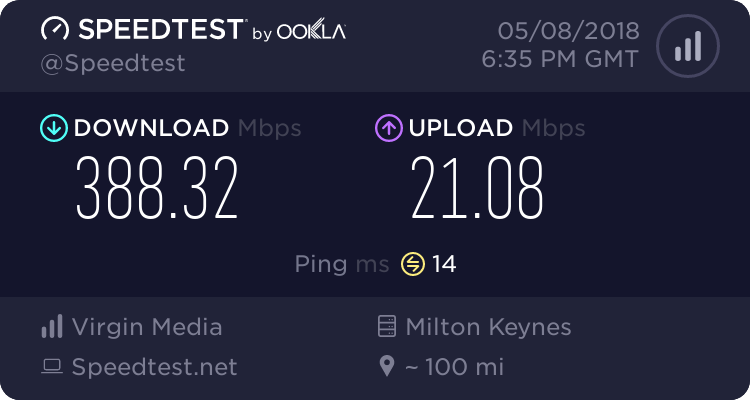 But no 330 Mbps downstream, and with 50 Mbps upstream costing £80pm, it's £20pm more than the competition with 330/50 (well, it's not really so much competition due to different target audiences, I guess). I would have to agree with that too. That is a lot of money for G.Fast 160Mb. Slightly unrelated, but I believe my FTTC cabinet may have had the capacity increased recently as it was full and a short while after OR came out it was back to available again. Though could be pure coincidence since people may have switched to ADSLx or ceased. I know the cabinet had 6 line cards when it was plonked into place back in 2015, which I presume would be the standard 48 port (sadly can't really tell from the photo I have). I don't see a High Density upgrade, so I imagine they can just swap out the 48 for 64 port line cards these days?